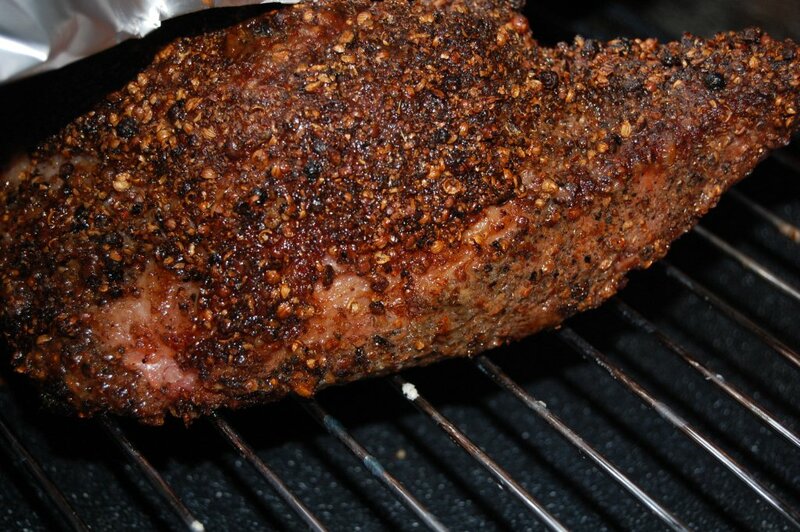 Pastrami covered with ground peppercorns and coriander seeds…fabulous and another successful recipe from Charcuterie. 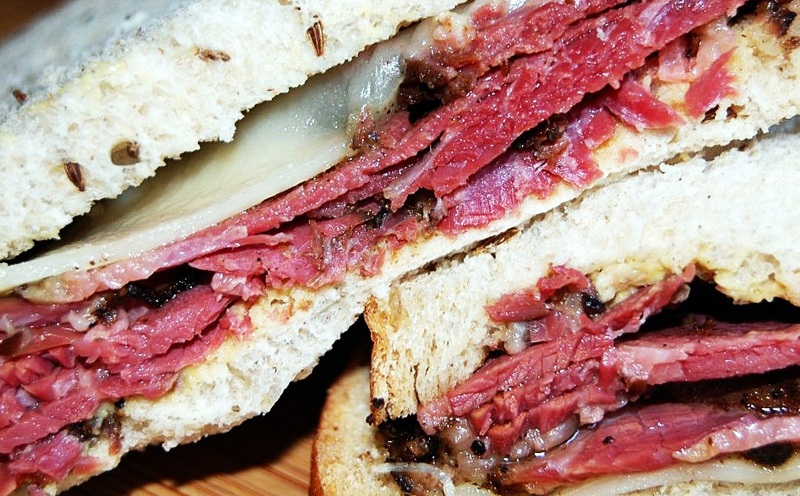 I don’t think that I’ll ever buy pastrami again from a deli; I’ll just buy a larger brisket the next time. When I purchased the brisket for the corned beef, I found a smaller piece (2 and 1/2 lbs maybe) to make the pastrami, just trying it for the first time so I didn’t want to ruin a big hunk o meat. I did smoke it for about 2 hours on very low heat, used what wood I had, a blend of oak, cherry and apple, no hickory. After the smoking time I did as the recipe suggested and finished it in a 225°oven for at least 2-3 hours (tested for tenderness along the way) yum. You can do what the recipe suggests in the oven method directions, but I found the time to be off even for the small piece that I was making. I actually covered it tightly with foil from the beginning of the cooking time. After I tasted it and found it to be a little on the tough side I put the pastrami in a foil like basket to hold all the juices in, set it on a rack, added water to the pan and tightly covered the pan with heavy-duty foil, this was again roasted for another 1 and ½ hours. I saved the juices and after refrigeration, removed the congealed fat on top of the pan juices. 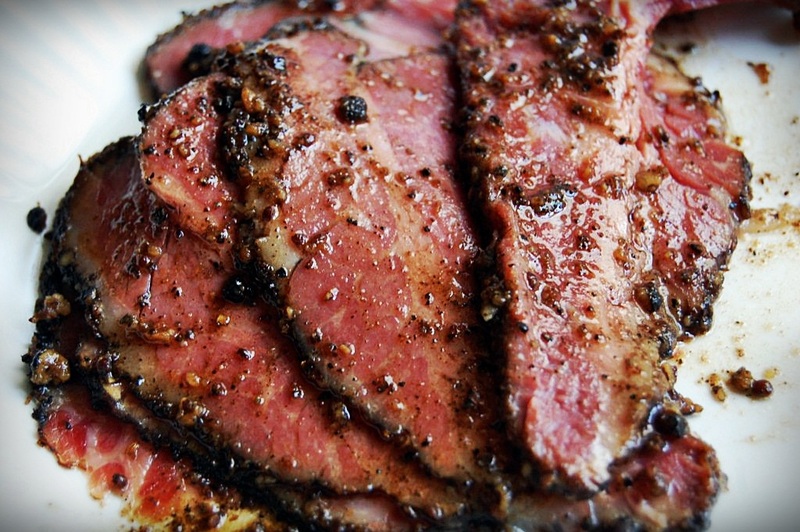 Steam the pastrami to reheat and pour warmed pan juices over. Make the pickling spice first. “So this is what I do when I want both smoke and long slow cooking. I smoke the meat for a couple hours. Then I transfer it to a 200 to 250 degree oven to finish. With this pastrami, I would cook it in the oven for 30 to 60 minutes to bake the smoke on, and then cover it with foil and 1/2 cup of water and cook it for another 2 to 4 hours till it’s tender (the water is to make sure there’s plenty of steam). So here’s lunch and while not piled on like a Carnegie deli sandwich, my sandwich was delicious.